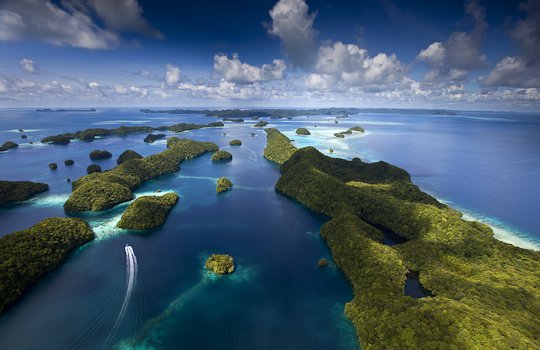 When viewed from the air, the islands of Palau, Micronesa rise out of the Pacific Ocean like fuzzy green worlds surrounded by surreal blue waters and coral reefs reminiscent of James Cameron’s Avatar. The experience here has been enlightening and like many of my assignments that take me to the far ends of our magnificent planet, my mind lingers for weeks afterwards and what I just saw. 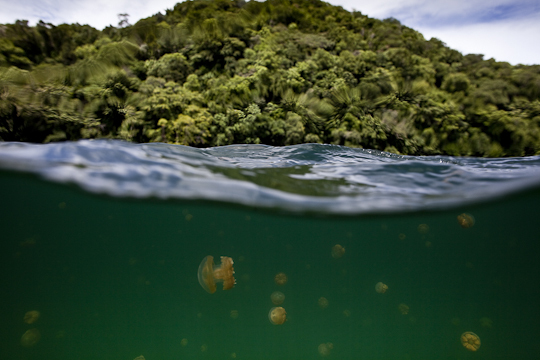 I spent 10-days here in Palau on the edge of the Coral Triangle shooting an assignment for The Nature Conservancy. 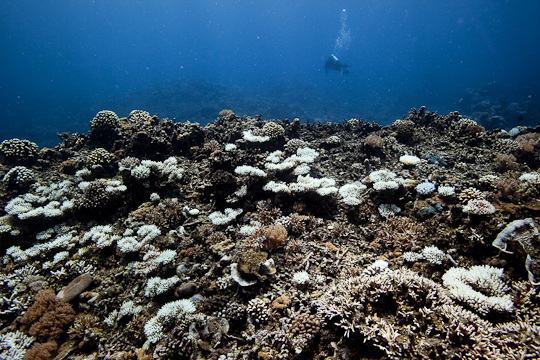 The goal of this assignment was to document a disturbing trend that accompanies climate change – coral bleaching. Bleaching happens for a variety of reasons but the most obvious is warming waters. While these waters are beautifully warm and pleasant to swim in, if they are too warm, coral become stressed and die-off. 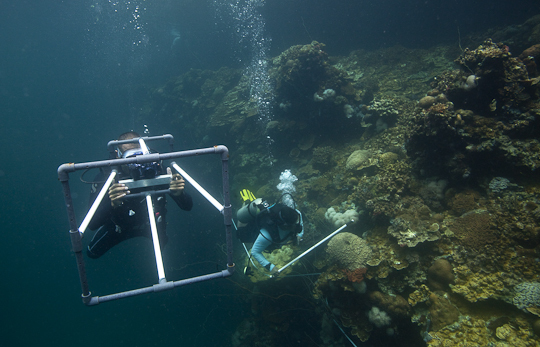 My assignment was to capture science in action, to document the important work TNC and their local partners, The Palau International Coral Reef Center, as they monitor these sensitive habitats. 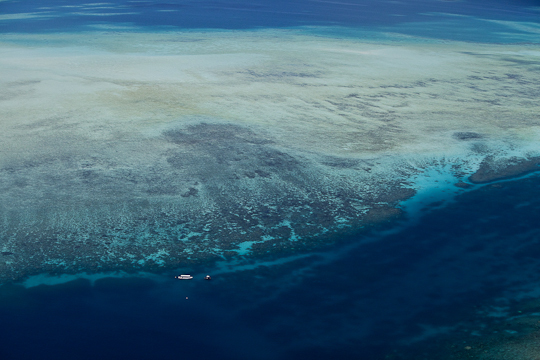 Arial view of 70 Mile Islands and surrounding patch reefs. This is a protected area. 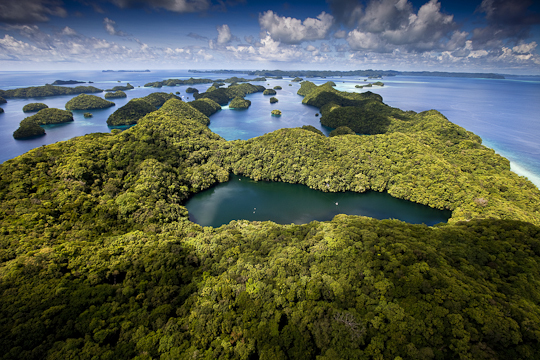 Seeing Palau from the air is critical to understanding the scale and significance of the rock islands and marine ecosystems that comprise this crown jewel of the Pacific. 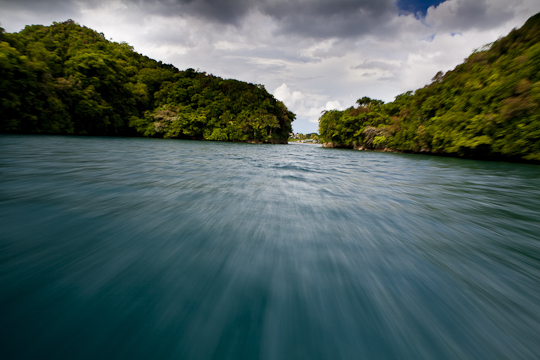 A typical view of the rock islands while speeding through on a boat. Healthy, pink coral, abundant with life. 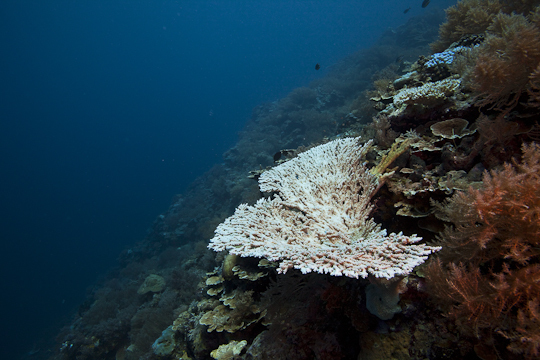 At first glance, this coral reef looks healthy, but upon closer examination you can see white tips on some corals, an indication of coral bleaching, a process where the stressed corals expel the colorful organisms living on them, leaving only white coral behind, hence the term bleaching. 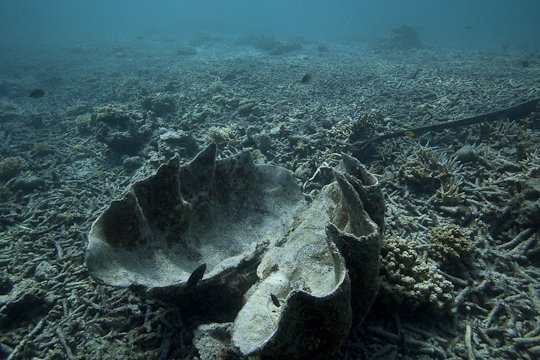 A collapsed coral reef from the 1989 bleaching event. This reef never recovered and all life has left. 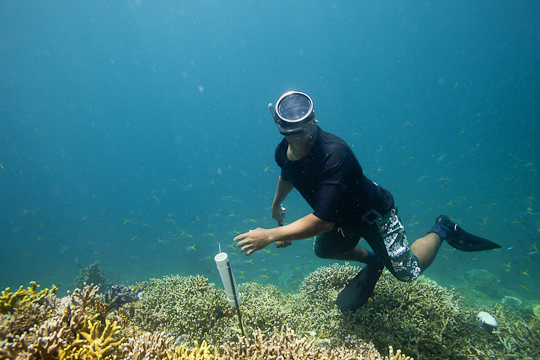 Researcher Yim Golbuu inspects the reef for signs of bleaching. Using a meter square, researchers photograph sections of the reef along a transect, using the photos later to count species diversity. A dive boat gives a sense of scale along the massive reefs of Palau. 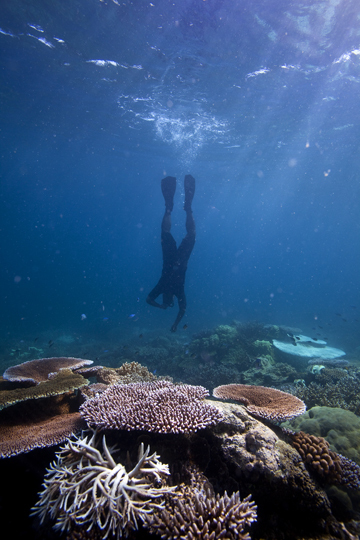 A research swims off in the distance after inspecting a reef with abundant signs of white, bleached corals. 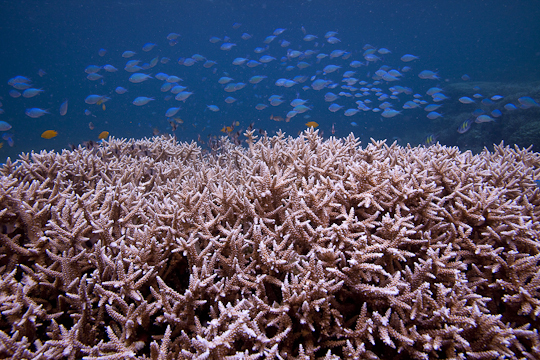 Another cause of coral die-offs besides climate change is something known as sedimentation, a process where soil from the islands washes off during heavy rains and settles on surface of corals, blocking sunlight and the important processes of photosynthesis. Construction and urban growth have accelerated this process. 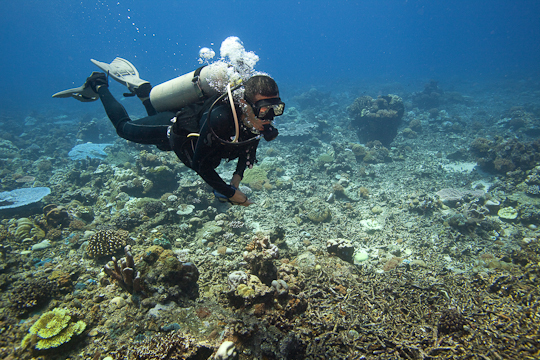 To monitor it, researchers free dive, often holding their breath up to 4-minutes per dive, and install PVC pipes to collect samples of the sediment being collected in various locations around the islands. A researcher heads for the surface after hammering a PVC pipe into the reef to monitor sedimentation. 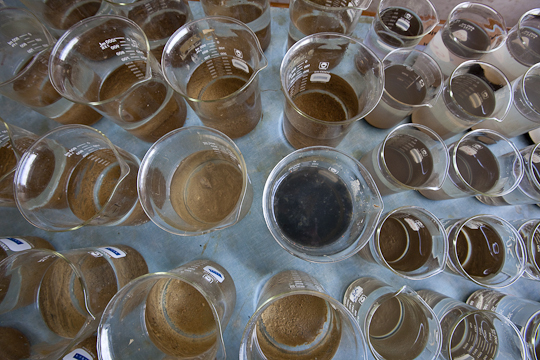 After a prescribed period of time, the PVC pipes are collected and put into labelled glass cylinders where their levels and composition are analyzed, providing important data about sedimentation. 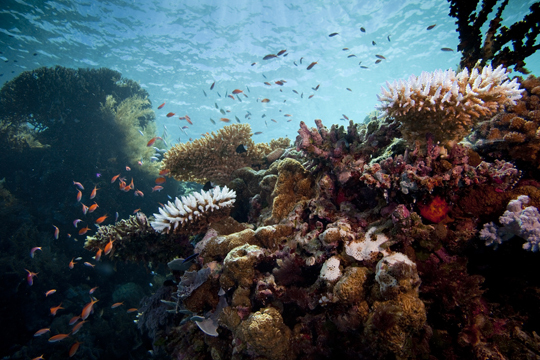 This image of a pristine coral reef was photographed in 30 feet of water, however at the top of the frame, you can see the trees of the rock islands. At first they appear like more coral, but you soon realize they are above the surface. Photos like this remind me that all the worlds are connected, land and sea. 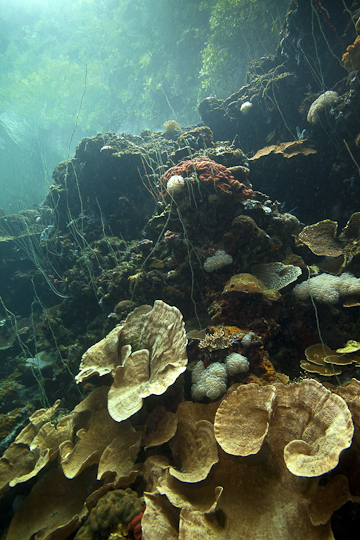 In truth, a coral reef is just a submerged rainforest, with abundant diversity. The lake in the foreground is a geological anomaly. Separated from the ocean by a thin strip of land eons ago, the lake is still fed by underground springs that lead to the ocean. Inside the lake, though, is the true spectacle. 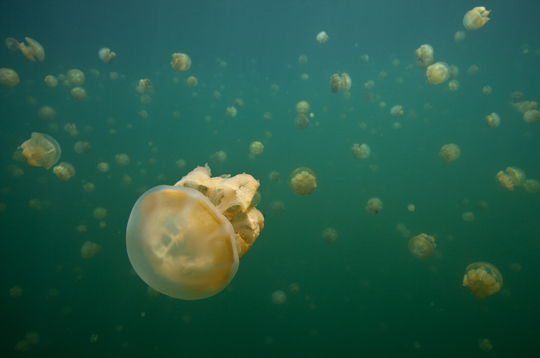 Millions of jellyfish inhabit the lake but have no fear, they have evolved over the years with no predators and are trapped inside this lake. Because of this, they have no stingers. Jellyfish lake, as it has become known, is one of only two lakes like this in the world. 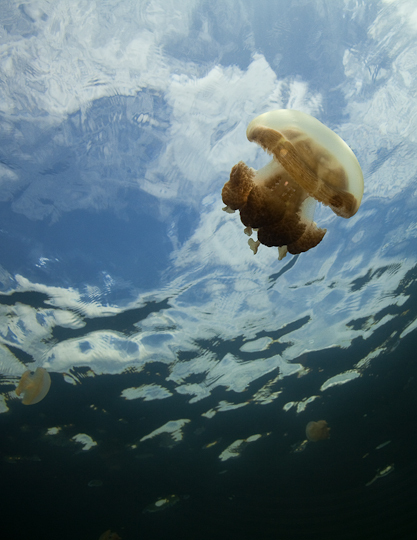 The conditions here are perfect for the survival of jellyfish which eat plankton that grow here. Still, this lake is an indicator of climate change, as temps rise, plankton die off providing less food for these creatures. They are a fantastical creature that resemble miniature, undulating lampshades that bump off of you as you swim through them. An important part of the local culture is fishing. 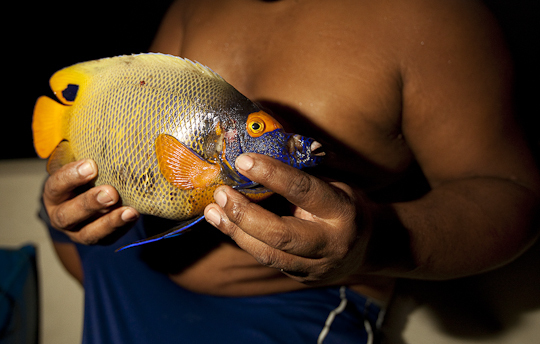 Palau lives off the ocean and without a healthy reef system, a key element of culture and nutrition would also die off. 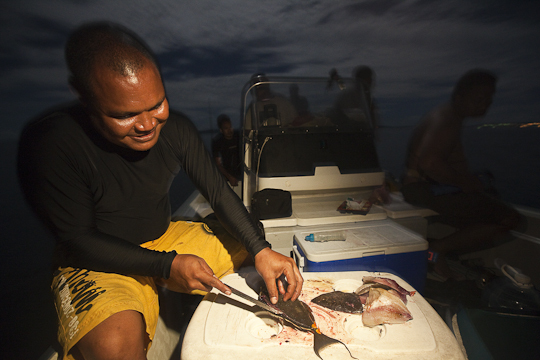 I had the opportunity to accompany a local group of men on an evening of night spear fishing. 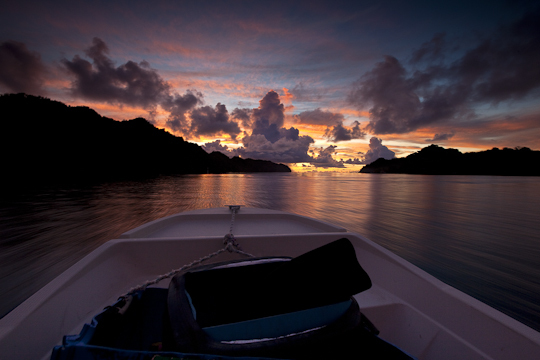 Departing under a magnificent Palauan sunset, we headed out into the open ocean. 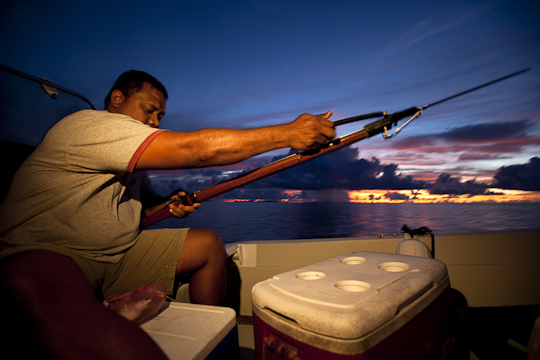 A man prepared his speargun for an evening of fishing. 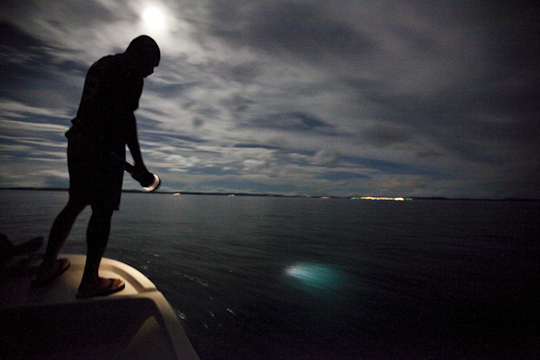 Using a flashlight to locate the patch reef they want to fish at, it may be a difficult night of fishing with a full moon. 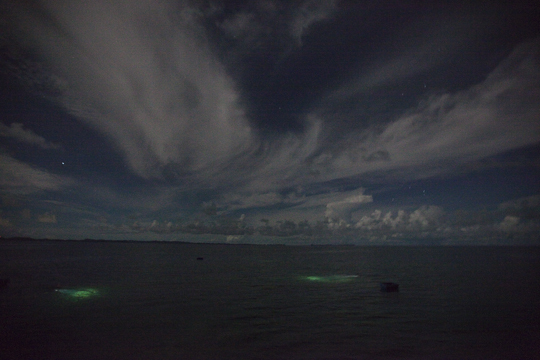 Submerged beneath the surface with flashlights, holding their breath for up to 4-minutes, the spear fisherman’s lights can be seen glowing beneath the surface of the ocean. While most fish come home to feed the family, the fisherman nourish themselves on the boat with the freshest sashimi (they brought soy and lemon) you’ve ever had. 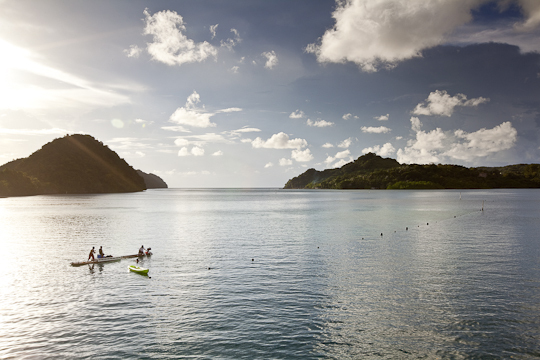 Stunning beauty abounds here as a family free dives for fish outside the city of Koror, Palau.